First I must apologize for being late this month. I had knee replacement surgery and it threw me completely off schedule. The surgery went very well. I was walking without a walker or cane (around the house) after just 8 days. It was my second such surgery. The first didn't go nearly as well so I'm delighted. We will be starting a new free BOM this month. You chose the basic parameters for this quilt. 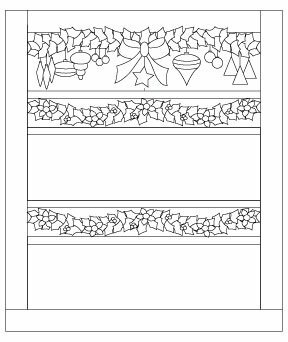 It is to be a row-by-row, elegant, Christmas wall hanging. I began by studying the photos on Facebook of quilts made for the Row by Row Experience. There were so many beautiful quilts. I loved those with different colored backgrounds. Your request for an elegant quilt opened the door for a variety of non-traditional applique fabrics. 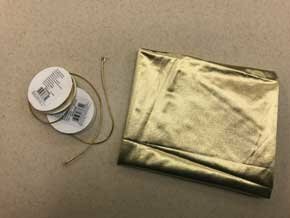 I shopped for glitzy, metallic fabrics. I looked for 100% cottons that had gold threads running through the design. I dug through my fabric stash and found 20 year old fabrics that met the criteria. I have my bauble row just about complete. There are a couple of things that I'm not satisfied with but more about that later. This month I will be publishing the holly row as seen at the top of this newsletter. The diagram to the left shows the first two rows that I have designed for this quilt. Yes, that means there are two additional rows that I haven't finalized yet. The middle row will be the lyrical row. It has a staff with notes, a french horn and a harp and, of course, bells. I'll be starting to applique this row next week so it is very close to being done. The bottom row will have candles and snow globes. I have it sketched in but still have a lot of work to do on it. The inside measurement of the rows is 32" x 45" (finished size). I'm sure that I don't want an appliqued border. The diagram has a 3" border bringing the size of the finished top to 38" x 51". I'll probably wait until I have all of the applique done and the top together to determine if I'll add a border. This BOM will last for one year. This will allow you a couple of months to do each row. This month I'll be publishing the 5" holly row. Yes, your eyes aren't deceiving you. There are two identical rows. That's part of making it more elegant. I'll wait until March to publish the bauble row. I have shown the holly row at my workshops last fall. There was one major concern expressed by many appliquers - all that holly. I find holly to be one of the easiest styles of leaves to applique. Usually 4 out of the 6 points are greater than 90 degrees. However, there are other alternatives. Let's make it one of the first questions we discuss on Facebook. "What would you do if you didn't do the holly row?" Here are the cut sizes (finished) measurements for the rows. I chose a gold braid for the strings on the baubles. I had a gold lamé with a white tricot backing that I decided would be perfect for the tops of the baubles. 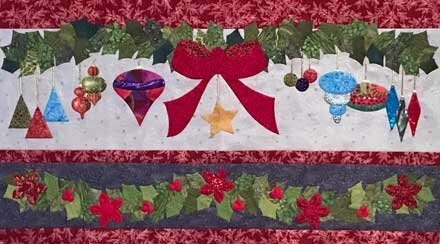 The long baubles to the far right above are appliqued from a stretchy, glitzy fabric. The end of the bolt called it a "Performance Fabric". I discovered a huge stash of fabrics with gold threads incorporated into the designs in my sewing room. I had purchased these fabrics over 20 years ago. We stopped at every quilt shop between Webster City, Iowa and New York City. I had always intended to make a quilt but had never gotten around to it. The only fabric from this stash in the bauble row is the large purple/red bauble just to the left of the bow. All of the other bauble fabrics were purchased this fall. All of the greens for the holly came from my stash. Working with these fabrics was a real learning experience for me as I had never appliqued with them before. I realized that you would have as many questions as I did and I wanted us to share what we learn about working with them. Last month I asked if you would like to have me create a Facebook page where we can share our experiences and learn from each other. The response was an overwhelming "YES". I have to admit that creating this page and getting the first 2 videos uploaded to it has been a challenge. Actually it was easier than I thought. I was making it so hard. To follow us on Facebook go into Facebook. Search on "Apple Blossom Quilts". Then select the one that says "organization". Click on "Follow". I would love to have you join us. I have created 2 new videos about the construction of this quilt. The first is a video that will teach you how to make the 3-D gathered petal flower in the holly row. This flower was designed to work with Quick Prep Applique (my form of back basting). It can, however, be used with any form of back basting. 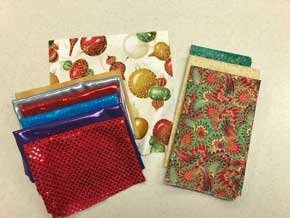 It is surprisingly simple to make and adds a wonderful dimension to your quilt. (We can discuss using this technique on other flowers shapes in our discussions on Facebook.) The second will teach you my method of appliqueing circles such as the center of this 3-D flower. You can view these videos 2 different places. For those of you who will be joining us on Facebook, the videos are available there. Or you can view them on YouTube. Here are the links to YouTube. How to make a 3-D gathered petal flower. How to applique a circle. Click here to download the Holly Row. I'll only be providing yardage for the background. You won't need a lot for the applique. Because I'm not sure about the borders yet, I bought double the fabric on the assumption that that would be enough for whatever I decided to do about the borders. Click here to download the fabric requirements and initial cutting instructions. I have a number (at least 6) quilts that I have designed and made but haven't published the patterns as yet. I guess you can see the part of my job that I like the best. I have decided that the only way to get this published is to promise you that they will be published. Once I've made that commitment I'll get it done. So here goes. I will be publishing two children's patterns first. In February I'll have a pattern named "Froggie, Froggie". In March, the pattern will be "Sleepy Teddies"
Well, that's it for this newsletter. There has been a lot in it about the new, free, BOM. However, I realize that I may have missed some important information. If so, you won't have to wait another month to get answers to your questions. Join us on Facebook and I'll be able to visit with you there.